Most of our feline friends love their own little place to spend there time sleeping the day away. The average cat sleeps for 13-18 hours a day during daylight hours. The exact number will change according to the cat’s age and personality. Because cat’s have tremendous vision at night, they spend most of the time prowling around looking for things to attack and play with like little mice around the house. We have comfortable beds, so why shouldn’t your cat be sleeping in their own little cat beds. Having a special place to sleep will certainly make him a happier cat. 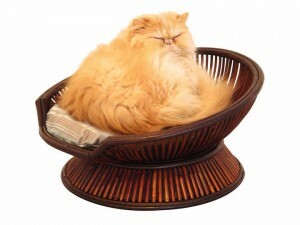 There are all sorts of cat beds ranging from the very basic to the positively opulent. I have also found from taking care of my seven cats they like to sleep on cat trees, window seats, small crinkle throws and even outdoor kitty heated pads. So make your cat a happy camper this winter with a new place to sleep.